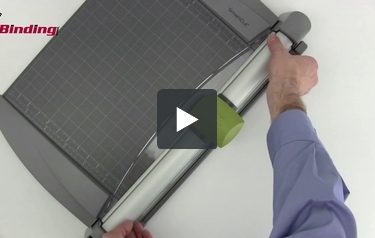 Has the blade for your SmartCut A500 series cutter become dull? This high quality replacement blade is designed for use with the GBC SmartCut A500 Rotary Trimmer, The GBC SmartCut A510 Rotary Trimmer, The GBC SmartCut A520 Rotary Trimmer, and The GBC SmartCut A530 Rotary Trimmer. Replace your blade today or buy one to have on hand for when you need it. This is a great product but not the answer to my issue- my smartcut machine was dull so I bought a new blade, but it is not the issue. Been buying this blade for several years, always sharp and well made. The blade is a perfect replacement for the older GBC Smartcut A520 Procut. The item is an exact replacement and works like new. Item was shipped fast. Great service from MyBinding! Got the items within 2 or 3 days, and are thrilled with the new blades! We have an old GBC Smart Cut A510 trimmer and we looked all over for the replacement blade. This one fits just right and works like a charm. Works great and the company is easy to order from. They also ship quickly. Welcome to MyBinding's How To videos. 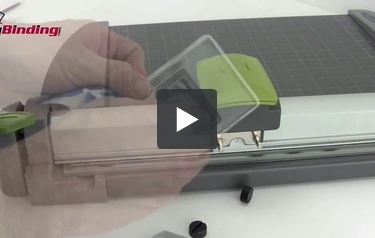 In this video you will see how to change the blade on a SmartCut Commercial rotary trimmer. It's quick, easy, and safe. The first step is to remove the two screws on the base of the cutting unit, either by hand or by a flat head screwdriver. Then reach down and with a little bit of force, remove the entire blade unit. It will come out with the blade attached to the back part. Being careful never to touch the blade, as they are very sharp, remove the new blade from the packaging and remove the safety plastic. And place it back on the two screw heads. Be sure to dispose of the old blade in a safe, proper manner. Screw the two nuts back on, make sure they're good and tight, going over both sides two times. There it is, an easy blade change on a SmartCut Commercial rotary trimmer. For more demos, reviews, and how tos on all things office, check out MyBinding.com. Welcome to MyBinding's How To videos. This video will show you just how easy it is to change the cutting mat on a Swingline SmartCut Commercial rotary trimmer. With replacements ready, you'll notice there are two divots on either end of the cutting length. Place your fingers inside them and pop out the cutting mat. You may need to jostle it just a little bit. At this point, you can either flip it over and use the other side for a while or replace it altogether with a new one. Just make sure the mat snaps in all the way. There you go, an easy mat change on the Swingline SmartCut Commercial. For more demos, reviews, and how tos on all things office, check out MyBinding.com. Either one may be the issue. First, try to rotate the cutting mat or turn it over. If this does not help, you may need to replace the blade. IS COMMERCIAL THE PERFORATING BLADE LIKE THE MODEL 9613RB? Thank you for your question. The Swingline SmartCut Commercial Replacement Blade - 9613RB is not a perforating blade it is a standard cutting blade.